The 1792 United States presidential election in New York took place between November 2 and December 5, 1792 as part of the 1792 United States presidential election. The state legislature chose 12 representatives, or electors to the Electoral College, who voted for President and Vice President. 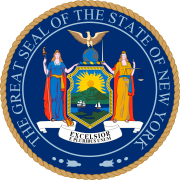 New York, unanimously cast its 12 electoral votes for incumbent George Washington during its first presidential election. Although the state had ratified the Constitution to become the eleventh state on July 26, 1788, it did not participate in the first presidential election in 1789 due to the state legislature being deadlocked. This page was last edited on 13 January 2019, at 15:35 (UTC).